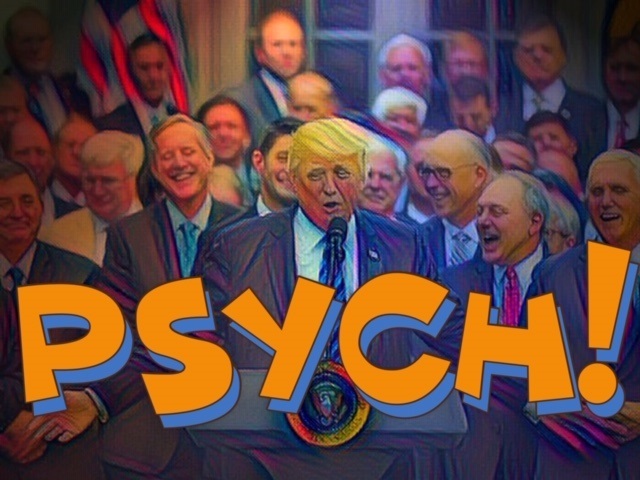 When I was growing we use to use the word "psych" to indicate we said something we really didn't mean. It was intended to play the fool on someone. Well, this whole Republican fiasco concerning to investigate or not investigate got me to thinking. Republican Senator Flake speaking last week to a seemingly easy to deceive American public. We will have the FBI investigate Brett Kavanaugh's lurid sexual past. Then the United States Senate will be able to truly frame a meaningful decision. America' reaction, oh boy, how honorable this Arizona Senator is. How bipartisan are this Senator's actions, he really is going to demand that the FBI complete a full investigation of all the accusations. The agents will not have any limitations on the scope of the investigation related to Brett Kavanaugh's past related to sexual violence. The news media spends more than 48 hours hailing Senator Flake's decision. The editorial pages are filled with platitudes related to Senator Flake's decision. My Facebook timeline is filled with posts hailing the judicious nature of Senator Flake's decision. Why back in the caverns of the old boy network the song lyrics remain the same. The Republican leadership's response can be summed up in one word, this word speaks firmly of the true position of the 51 Senators set to confirm Brett Kavanaugh to the United States Supreme Court come hell or high water. This one-word message goes out to all the suckers drawn to believing that Senator Flake truly believed in a just investigation.